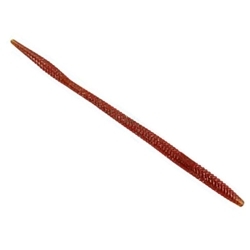 The Yum MightEE Worm is a straight-tail worm with plenty of action. The tail tapers before bulging back out, prompting the Mighty Worm to writhe and dance when fished on a Texas rig or jighead. You can also fish it on a carolina rig if you want a more subtle swimming motion. The Yum Mighty Worm is so versatile you can also fish it wacky when you insert a finishing nail into the tail for added weight and action.